It’s definitely mid-life facelift time of year. In the past few days we’ve brought you the revised Land Rover Discovery, Range Rover, Range Sport and Merc S-class – today it’s the turn of the latest Audi Q7, finessed and fettled for the 2010 model year. 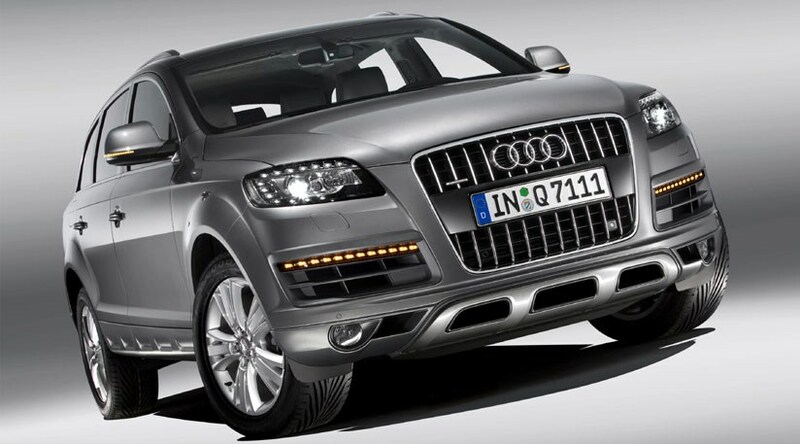 So what is new on the facelifted-for-2009 Q7? Err, we’ll have to consult the press blurb here. That enormous single-frame grille sports new vertical chrome bars to contrast with the black, high-gloss finish. And those bumpers are radically different (only joking, we couldn’t really tell at a glance, either) while the door mouldings have been subtly updated. We could go on. It’s a new German car. I’m waiting for reams of new gadgets! Quite. The facelifted Q7 gains a new adaptive headlamp system, C-shaped LED day-running lights framing the headlamps, ceramic brake options on eight-cylinder models (with a total of 24 pistons to drag this leviathan to a halt!) and something called Modular Efficiency Platform, designed to capture energy during coasting and braking to top up the battery – saving up to 5g/km of CO2. A neat touch. Other Q7 qualities remain. It’s a seven-seater, but not quite as practical as the Discovery in the third row. Drop the sixth and seventh seats, and there’s a vast 775 litres of luggage space. But somehow, despite these changes, we can’t see the Q7 displacing the smaller, but still roomy, Q5 as our favourite Audi SUV.